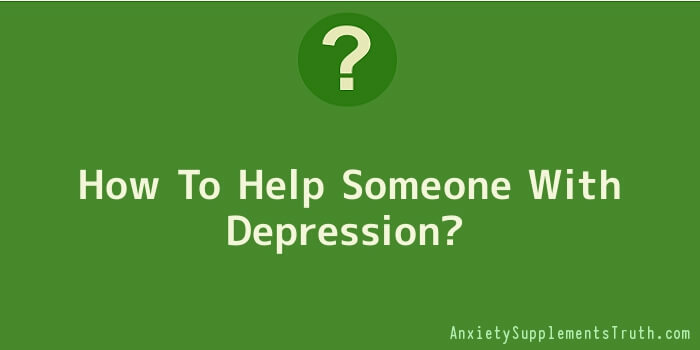 Have you been thinking about how to help someone with depression? There are certain situations in life that trigger us to feel sad such as death, betrayal or loss. And these are all times when depression occurs naturally. The problem comes in when the symptoms continue for extended periods or occur without any obvious triggers. However, overcoming depression is possible with the appropriate treatment. There are a lot of things that you can do if you have been wondering how to help someone with depression. Get started by discovering a few helpful approaches to assist your relative or friend out of this condition. This guideline will aid you to take the appropriate course of action. If you want to help someone who is depressed, it is essential that you understand this condition and its symptoms. Depression is a term that is commonly utilized to describe emotional changes wherein a person senses a feeling of hopelessness and extreme sadness. There are many signs of this condition that you need to watch out for. One of the signs is low self esteem because the person feels worthless and obsessed with guilt feelings. Another visible sign when a person is depressed is the alterations in energy levels. This individual will not enjoy the usual activities that he or she loves and will shy away from social gatherings. You may also observe that there are changes in food habits as well as sleep. To begin with, it is helpful that you know about the condition as the famous saying goes knowledge is power. Search this website and other online locations for more information on this illness and find out the things that you need to know about it. A good understanding of the treatment methods and how effective they are, are also helpful for you to assist in the process. Your own knowledge regarding this condition is a great tool in overcoming depression. Another thing to consider when it comes to understanding how to help someone with depression is to pay attention to the symptoms that the individual is experiencing. This way you can understand what your loved one is going through and you can help him or her all the way. And it is also essential that you help your loved one to accept that the problem exists. This is vital so that the treatment will be effective and successful. It can also help to get the individual to perform physical activities by exercising or perhaps participating in sports. Showing your patience at all times is very essential, since the person can become rude and easily agitated. To help them remove the feeling of worthlessness, you also need to remind him or her love as well as support. Simply being there is an excellent step toward your goal of how to help someone with depression. Keep in mind that the process takes time. Hence carry with you your patience as well as understanding. It can also be helpful to encourage the family member or friend to seek professional help as soon as possible. But do remember, the final responsibility to seek help belongs to the depressed person not you. So, take care of yourself first and foremost. If the person decided to take any kind of medication, attend support groups or get into a therapy with a professional, make it very clear that you will be always support them. Besides that, often offer the person who is depressed to talk to you and keep the first point in mind. You also can plan activities that are uplifting and fun that you two or a group can attend. Do not make the person feel like you are pitting him/her. Treat them just like any other normal person most of the time. Try to avoid saying that depression is very common and every normal person can develop a depression. This will make them have the illusion that their depression is just “normal” which leads them not to try as hard when dealing with it. If you really want to help someone who is depressed you have to educate yourself first. Chances are that you have no clue what depression feels like and why people develop depressions. By educating yourself you will know learn about some factors that may cause depression, you will know about symptoms that depression cause and also know better about helping people who have depression. Depression cannot and will never be cured in a short period of time. It can take up to months and even years for a depressed person to fully recover. A good day or even a good week does not mean that a person is not depressed anymore. Make sure you let him/her know that you will be by their side and support them no matter how long it takes them to recover.